Emotional scenes that tear at the heart strings: concert arias are great dramas reduced to a few minutes and focussed on one single character. But what is the origin of the genre? And what inspired the great composers, stimulated by great voices and great moments in literature or even by the operas written by their fellow musicians? What they composed were moving, dramatic scenes for the concert hall, and they gave their all in creating them. Christiane Karg is one of those fascinating voices, and who knows which concert arias Haydn or Mozart might have written for her? She is certainly one of today�s most interesting German singers, with an international profile. After studying in Salzburg, her career initially took off in Hamburg and Frankfurt. Her solo career has since taken her to the Semperoper in Dresden, to Salzburg, Covent Garden and Glyndebourne, and the list of her stage partners is clear evidence of her elevated status. Following her highly acclaimed Strauss Lieder album, her fourth CD is a new orchestral recording on which the soprano chooses the tried and trusted Arcangelo ensemble with its conductor Jonathan Cohen to accompany her, as was the case on her 'Amoretti' album. After winning the coveted Echo Award for her debut album, 'Amoretti' gave her the breakthrough into the CD market. Well then: curtain up for Christiane Karg! On her latest disc, German soprano Christiane Karg reinforces her reputation as one of the outstanding Mozart singers of the present day, as well as showing her strengths in the dramatic soprano repertoire � a bold and hugely successful extension of her already proven lyric talents. Her voice has all the focus one dreams of in this music: agile yet powerful, with an intense and contained vibrato that brings back memories of some of the great Mozart sopranos of the 1950s. Yet there's also a warmth that really draws the listener in to sympathise with the singer at every turn, and she's as equally able to glide effortlessly up to high notes as she is to hit them suddenly. All but one of the quasi-operatic scenas on this recording set texts wholly or partly by Pietro Metastasio, the great opera seria librettist, and they each encompass a range of emotions � from scorn and desperation to resignation � that demand a quicksilver ability to capture and change the emotional temperature within just a few bars. Composed for some of the most noted singers of their times, they provide Karg with ideal vehicles to display her dazzling capabilities. Beethoven's grippingly dramatic Ah, perfido sets the tone, in a performance of such immediacy that the listener is hooked from the outset. The emotional twists and turns of the music are heightened not just by Karg's peerless singing, but by exceptionally vivid accompaniment from the period instruments of Arcangelo, with real depth (and, where necessary, delicacy) of instrumental timbre. There are many famous recordings of this work, but Karg's ranks with the very finest. In Mozart's Ch'io mi scordi di te, Karg's frequent collaborator Malcolm Martineau puts in a star cameo turn with the obbligato fortepiano part (originally played by Mozart himself). The two Haydn items demonstrate just what intensity the composer could conjure up, not just in the better-known Scena di Berenice, but also in the marvellous Miseri noi, misera patria, which starts with a gently swinging motion that only Haydn could have penned, but builds to a lively climax with plenty of vocal fireworks. Mozart's Misera, dove son, like Ch'io mid scordi di te, has links to the composer's Idomeneo, and for the most part it evokes an unforced nobility until the coruscating final bars, to which Karg rises magnificently. Mendelssohn's Infelice pensier � the only work here not dating from the 1780s or 90s � was commissioned in 1834 by the Philharmonic Society of London. 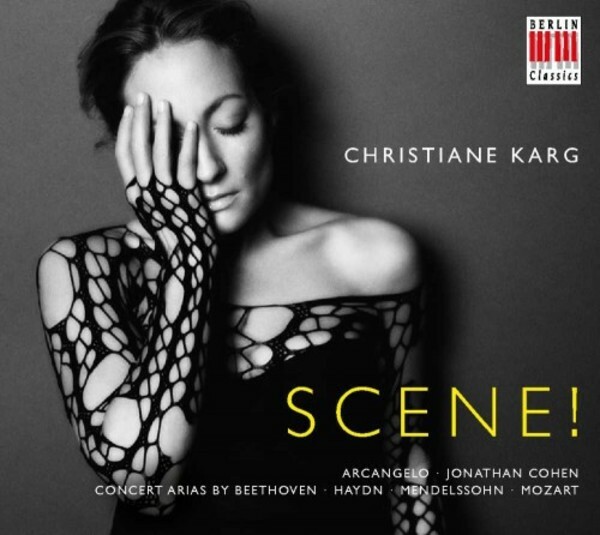 Christiane Karg performs the first version of this aria, deftly entwining her lines with those of the violin solo, beautifully realised by Alina Pogostkina. Here Mendelssohn's music extends the logical expressive line from classical intensity to early-romantic passion, with a thrillingly full-throttle concluding cabaletta. For lovers of quality singing, this is simply unmissable, and a brilliant addition to Ms Karg's growing discography.